(Nanowerk News) A polymer inspired by the lipids in cell membranes is proving an invaluable biomaterial. Like the cell membrane, the polymer 2-methacryloyloxyethyl phosphorylcholine (MPC) can provide a surface for biological reactions to take place, but it can also suppress unfavourable processes. In their recently published review article ("Cell membrane-inspired phospholipid polymers for developing medical devices with excellent biointerfaces "), Yasuhiko Iwasaki at Kansai University and Kazuhiko Ishihara at the University of Tokyo in Japan describe how developments in synthesis techniques by showing that the 2-methacryloyloxyethyl phosphorylcholine (MPC) have liberated the polymer’s potential for a huge range of medical and biological applications. Biomedical and life science applications of MPC polymers. In fact the polymers were already attracting interest in the early 1970s. However until more facile synthesis techniques were developed investigations were limited and the polymer was little understood. By 1999 MPC polymers were being produced on an industrial scale, allowing more substantial studies. MPC is easily polymerized in a range of architectures. The chemical can suppress reactions such as protein adsorption and cell adhesion and has a high and readily adjustable solubility in water. These versatile properties lend MPC polymers to a range of applications. The authors also describe methods for generating the polymer for effective use in non-fouling coatings. Formed into poly(MPC) brush structures with specified chain architectures, they can also be used as surfaces for controlling cell functions. In addition, the researchers explain how surface modifications with MPC polymers are effective in improving blood compatibility. The polymers can suppress protein adsorption, platelet adhesion, and platelet activation at blood-contacting surfaces and they can also be solute permeable. As such they are well suited for coating cardiovascular applications such as stents, cardiopulmonary bypasses, and ventricular assist devices. 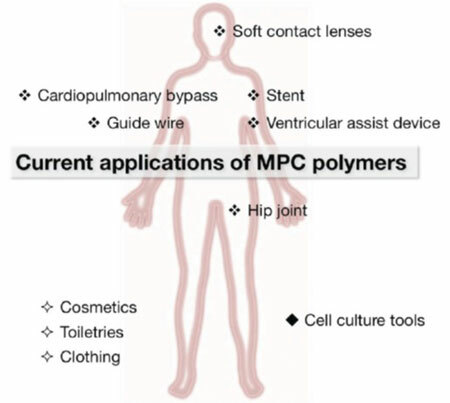 Based on the fact that “MPC and various kinds of MPC polymers are now available commercially worldwide, and many medical devices treated with MPC polymers are used in clinics,” they underline how far research into applications of MPC has advanced, and indicate how many possibilities remain for exploiting the chemical further.